L-system knitting first sample, a photo by MadeleineS on Flickr. I’ve been reading around the maths of growth processes for many years but I never dug very deep until now. The motivation for getting stuck in is this new collaboration with Julia Collins. I’m looking for systems that generate forms that appear in plants which I can translate into ways of generating textile objects. This is the first piece of experimentation, with a very simple L-system rewriting algorithm. In knitting terms it boils down to this. 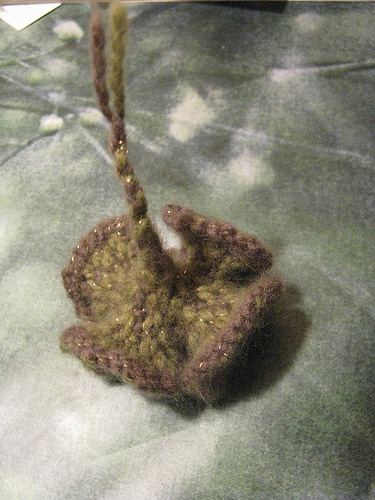 Cast on a green stitch. In the next row that generates a brown stitch. A brown stitch creates two stitches, one of each colour. And so it goes on… To make it more intersting I knitted it in the round.